Oh my goodness, I’ve watched this video at least once a day, since it went up on YouTube. A practically perfect song, Stay Close is the first single of Subiza, the forthcoming album from Delorean out June 8th. I am doing my best to wait patiently. There are a multitude of reasons why I need to move back to California, but weekend scenic roadtrips are towards the top of the list. When I lived outside Los Angeles I drove up the coast to Oregon, and I drove out to Death Valley. Now I read the California travel section of the LA Times constantly to fuel my daydreams. This particular article details a roadtrip on Highway 1 out to Yosemite. Of course, my devotion to National Parks only makes me pine for this trip even more. The Books have been one of my all-time favorite bands ever since I first heard The Lemon of Pink. The lack of new music from them in recent years has left a small hole in my soul. This week they finally published date, label, and title details for a new album. The Way Out will be released sometime this July on Temporary Residence. HOLY SWEET POTATO YES!!! The official proclamation was posted on The Books' blog, and includes some promisingly illuminating details. This could be their most groundbreaking work to date. 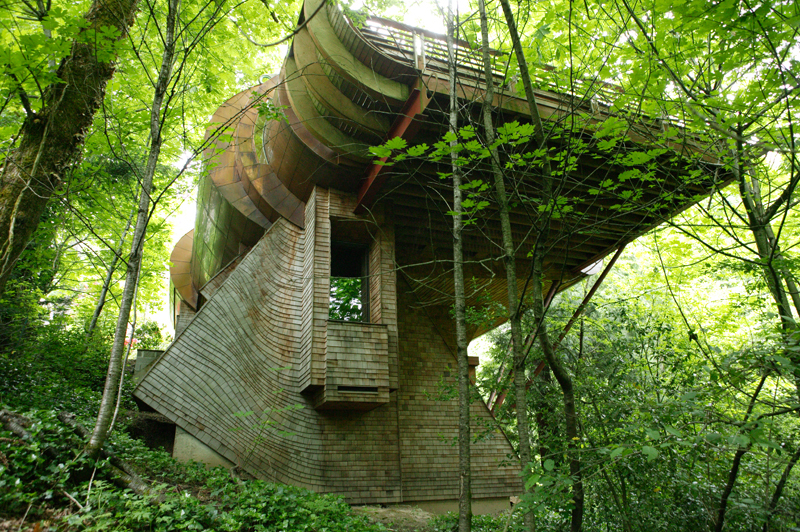 Designed in 1997 and constructed in 2004, the Wilkinson Residence in Portland, Oregon looks like a tree house for adults with impeccable taste and serious aesthetic fixations. The architect for the project was Robert Harvey Oshatz, and more photos of the house are available on his website. Apparently the client, who had very similar interests to me, wanted the design to be inspired from nature and music. I love how the house grows out of a steep slope up to the canopy, and the lines of the structure remind me of sound waves. This week All Things Considered featured a book by Michael J. Trinklein entitled Lost States: True Stories of Texlahoma, Transylvania, and Other States That Never Made It. As an avid follower of Americana with a love of history outside the confines of standard textbooks, this immediately had my attention. After the main article is a lengthy excerpt from the book, interesting stuff. There's the better known stories of the Mormons attempting to found their own state, and then there's the more obscure, like the great tale of Lost Dakota. Malcolm McLaren was everything a band manager ought to be. I learned about his work and career in an rock history course around when I started managing for the first time. Consequently, he was both my inspiration and idol in many ways. Not only did he have a comprehensive understanding of the business, he also understood the broader sociocultural significance of the music, and had a fine appreciation for talented creativity. Without Malcolm McLaren punk and rock would not be what they are today. This week I was very saddened to learn that on Thursday, April 8th, Malcolm McLaren died at the age of 64. He will be greatly missed, but his legacy will live on. Here are some articles from Pitchfork and Drowned In Sound in tribute. Hulu is currently showing a spectacular documentary on truck drivers called Big Rig by Doug Pray. I really like that the movie is fairly free of agenda or bias. It's mostly just about documenting a subculture primarily through the oral history of the society's members. There are also some stunning shots of the American landscape. On average, I put about 30,000 miles a year on my car. I love driving across my country, and have sometimes wished I could get paid to do it. So on a personal note, it was fascinating to hear the stories of the two female truck drivers interviewed.